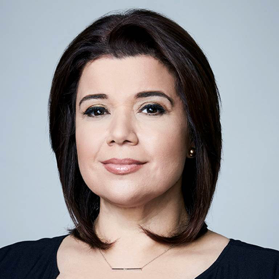 Ana Navarro, GOP Strategist and Political Contributor to CNN, ABC News, and Telemundo, is confirmed as opening keynote speaker for the 2019 NADOHE Annual Conference, March 7, 2019, Loews Philadelphia Hotel, Philadelphia. Respected on both sides of the aisle for her straight shooting and candor, Navarro frequently appears in the media, sought after by Meet the Press, Bill Maher's Real Time, Anderson Cooper 360, and The View, to name a few. "Ana speaks the truth, and she is willing to speak the truth to power without reservation..."
Navarro most recently served as the national Hispanic co-chair for Governor Jon Huntsman's 2012 campaign and the national co-chair of John McCain's Hispanic Advisory Council in 2008. In 2001, she served as ambassador to the United Nation's Human Rights Commission, devoting much of her energy to condemning human rights abuses in Cuba. In 1999, she worked in the private sector, representing private and public clients on federal issues, particularly related to immigration, trade, and policy affecting Central America. Navarro is a graduate of the University of Miami. In 1993, she obtained her BA in Latin American studies and political science. She obtained a Juris Doctorate in 1997. She was born in Nicaragua, and in 1980, as a result of the Sandinista revolution, she and her family immigrated to the United States. President Archie Ervin notes, "NADOHE is honored that Ana Navarro has agreed to serve as our 2019 conference keynote speaker. She bring a refreshing and important perspective to issues of immigration reform, DACA and human rights in general, all of which continue to be critical challenges for our nation and our world. She epitomizes courage and integrity in her unwavering voice for true equality for all." Navarro will speak on a topic aligned with the conference theme, Diversity, Equity and Inclusion Imperatives of the 21st Century: Leading with Purpose, Courage and Vision.